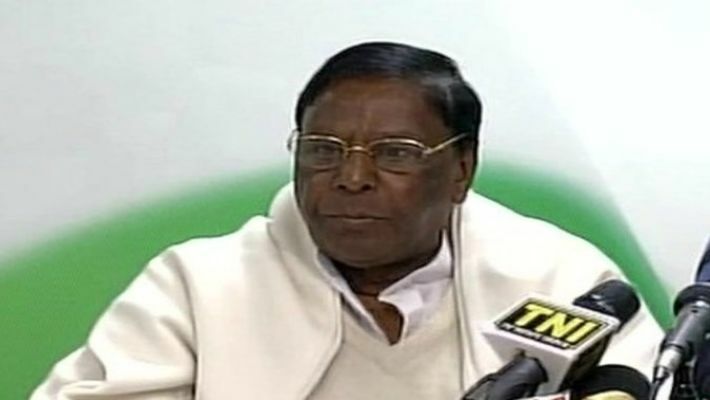 "I have made it clear that the benefit should be available for all families, including those belonging to the above poverty line category," Narayanasamy said. Puducherry: Puducherry chief minister, V Narayanasamy on Saturday, warned Lt Governor Kiran Bedi of "severe repercussions" if she did not concur with his government on the Pongal gift hamper scheme. But she later hit back asking him to "maintain decorum" in his speech. Speaking to the reporters Narayanasamy, who has been at loggerheads with Bedi on various issues, said he had on Friday sent a file, informing her that Pongal hampers comprising raisins, cashew nuts and cardamom should be available for free of cost to "all families without discrimination". Attacking Kiran Bedi on the Pongal gift hamper issue, Narayanasamy said that she would face "severe repercussions" if she did not see eye to eye with his government on the matter. "I have made it clear that the benefit should be available for all families, including those belonging to above poverty line category," he added. He claimed that the recent Madras High Court order, permitting distribution of freebies to all ration card holders in Tamil Nadu without any discrimination, was also applicable to residents of Puducherry. The chief minister charged the Lt Governor with "twisting and misinterpreting" the court order which, he said, had only restrained the Tamil Nadu government from distributing cash gift of Rs 1,000 to all families. "The free supply of provisions and commodities for Pongal is to cover all families, and the high court has also made this very clear," he pointed out. Bedi had on Wednesday hailed the Madras High Court order, directing the Tamil Nadu government to restrict the Pongal cash gift of Rs 1,000 to Below Poverty Line families. The former IPS officer had also said the order was a message to the executive and public officials making them sensitive to their responsibility and duty to serve with full awareness. Noting that there was a limit to everything, Narayanasamy said the Lt Governor "cannot run roughshod and misuse power and authority". He also termed as "unfortunate" Prime Minister Narendra Modi's response to the representations made by him all along on the style of functioning of the Puducherry Lt Governor. Reacting to the CM's warning, Bedi in a WhatsApp message said, "I am personally not afraid of anything." The Chief Minister and his colleagues should realise that when a file is sent to her office for approval it shall be read with "application of mind and rules as office of Lt Governor is not a rubber stamp," she said and added it was "principally wrong for them to expect the Lt Governor to be a mere endorser of their demands and views." Bedi also requested the Chief Minister not to use threatening words towards a constitutional office and "maintain decorum" in his speech and in the notes he was writing to her. Otherwise, she would be compelled to make those notes public for people to know what and how he was writing, she said. Hoping that "wisdom and maturity" will prevail on him for the broader welfare of the people of Puducherry, she wished the Chief Minister a happy Pongal.